Disclaimer: This is a mushy post. Mushy, because its banana bread for one.. LOL and mostly because its my sweetest friend's birthday today..my sole reason to bake this bread. She lives in India, across the ocean from where i live, but that does not stop a small celebration at home here. Reason to load up some extra calories perfectly :) Best friends , BFFs? Well i think the concept is a bit archaic now ,with both of us on the other side of 30's ;) And yes, 'best' does not capture the higher superlatives at all , nomore! Words are less as i try to pick some threads, from the remeries of a colorful tapestry, our friendship has been. A classical dancer by choice, she and i met during our post graduate program in Mumbai. A butter fingered me , met this prim and proper girl from the land of ghazals and ghalib. A poet too herself, i credit whatever i understand in urdu prose, to her. The first whiff of independence, just out of our respective homes then- i endearingly remember siting and talking for hours on the edge of her building's uppermost terrace where she rented an apartment. Haven't called her yet to wish ,but frequently our birthday conversations start with what budding double digit the other is rollicking on. Its a tradition now, to tease and giggle. Talking of traditions, we made a pact to celebrate and host birthdays for each other at a restaurant called Pizzeria, facing the bright Marine drive, when in Mumbai.. and we did keep up to it too. The varied discussions later by the sea, on life love career choices .. i remember we totally discovered an algorithm on love .. naive certainly :) And , how can i forget the ice cream sandwiches at rustomjee's on our way back to churchgate station, those were yum yum! Hmm ,it's all so fresh ..even after a decade, just like.. some wet mud on a potter's hand, feverishly working in his own barn. We were starkly different, complete opposites.. but life has a way for setting up pieces in a jigsaw like one can never imagine.. and here we are today, so connected not literally but in our thoughts and well wishes, that a phone call or an email does not matter really. Wishing you a happy happy birthday my friend, hope u have a long peaceful and an absolutely beautiful life..
Line your loaf pan with a greased foil , covering on all sides. Set aside and preheat your oven to 325F. Mix all the wet ingredients- banana, eggs, buttermilk, oil, vanilla essence, honey. Sieve your dry ingredients in batches of fourths directly in the wet ingredients and whisk completely till all is incorporated as one. 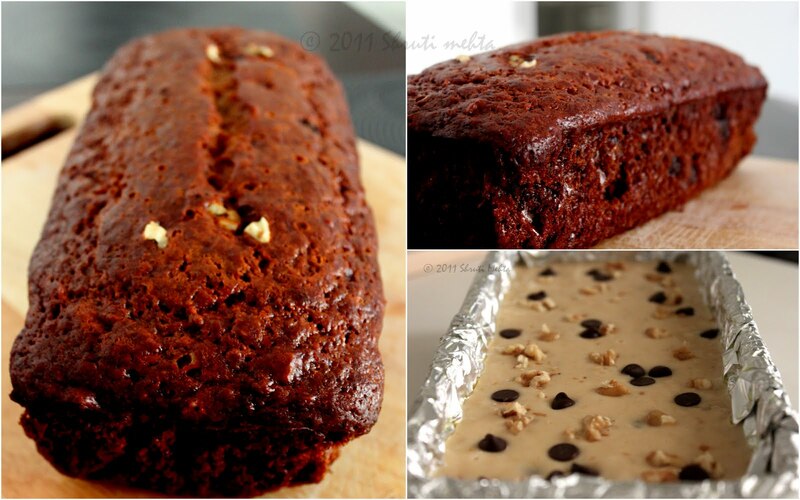 Fold in the walnuts and chocolate chips. Pour in your prepared loaf pan and bake for 2 hrs. Insert a toothpick in the middle of the loaf , if it comes clean the bread is done. Remove and switch off your oven. Let the loaf cool and later slice with a serrated / bread knife. I have been devouring the same as i write :) take my word , its the moistest bread i ever had and healthiest too .. no sugar no butter!! And yay! for the 50th post! touched...with tears in my eyes...never felt so special...miss u all the more...bread looks yumm...thanks sweetheart!! thats a lovely recipe. you have one beautiful blog here. will come again. 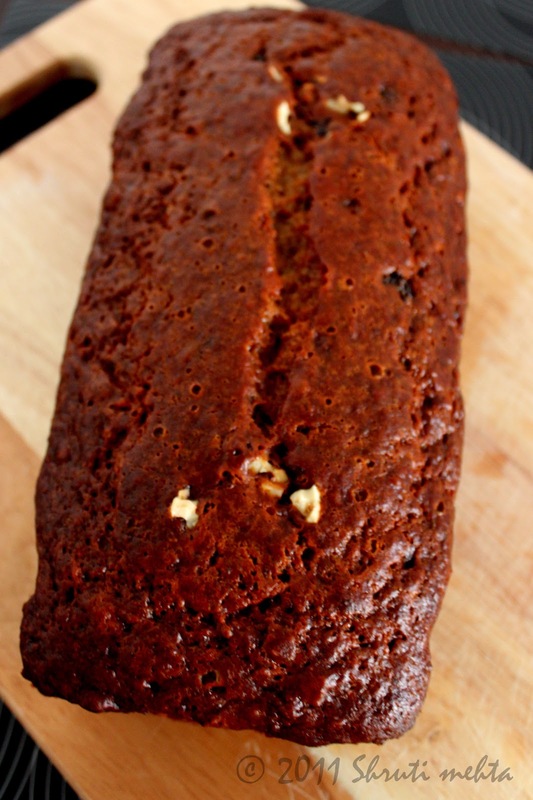 Oh, I just love banana bread! It looks so yummy! I'd eat a huge slice of it right now! I'm following you from Rome, I'm here on holiday but I live in Trapani, Sicily. Every picture on your homepage made me drool - absolutely divine pictures and yummy dishes! awesome!!! 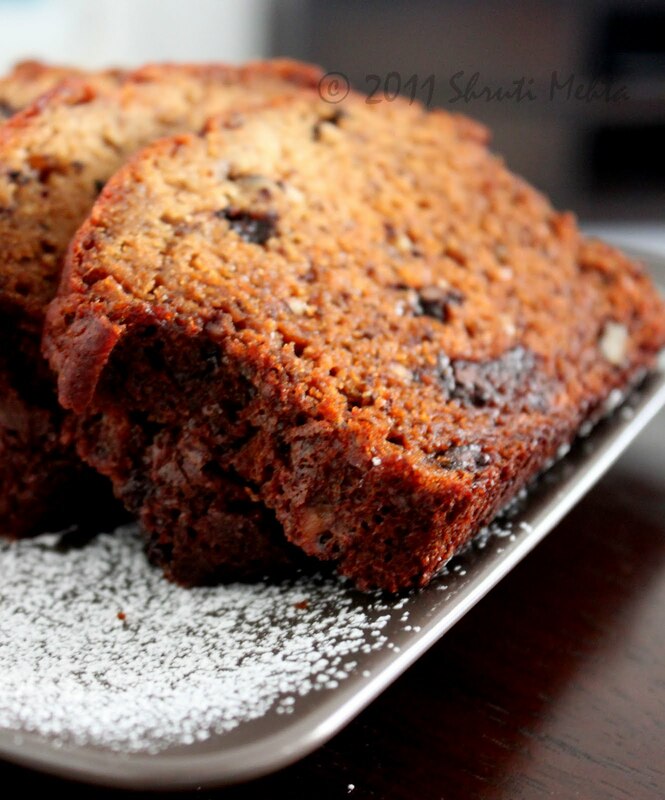 !The banana bread rocks! 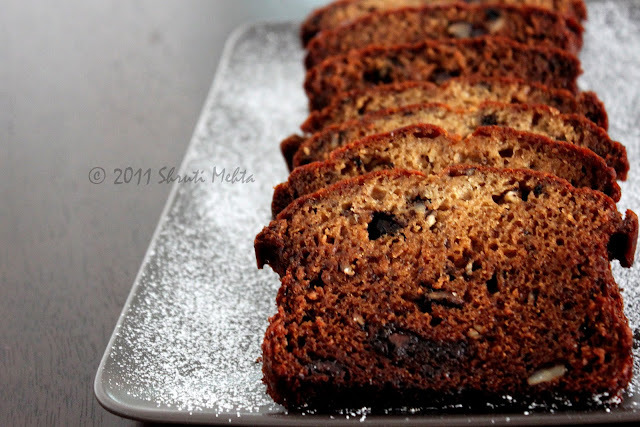 So soft and spongy banana bread,very nice presentation. sahi hain... thanks for this recipe.